Wednesday December 21st 1881 I was busy about the house all the morning and as soon as I ate my dinner started to town. I was down to Mrs Angiers and paid her what Norris sent. I got a new bracket for the sitting room. Was down to Hatts awhile, rained nearly all the afternoon and evening. 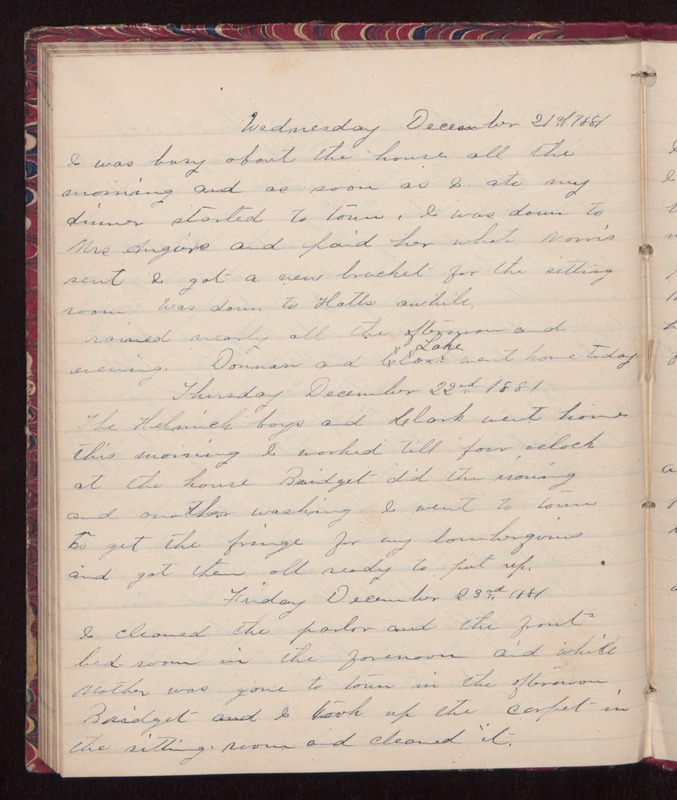 Donavan and Lake went home today Thursday December 22nd 1881 The Helmich boys and Clark went home this morning. I worked till four oclock at the house. Bridget did the ironing and another washing. I went to town to get the fringe for my lamberquins and got them all ready to put up. Friday December 23rd 1881 I cleaned the parlor and the front bed-room in the forenoon and while Mother was gone to town in the afternoon Bridget and I took up the carpet in the sitting room and cleaned it.